What ham can be without a test bench. Well until recently this ham had been without a real test bench for way too many years. 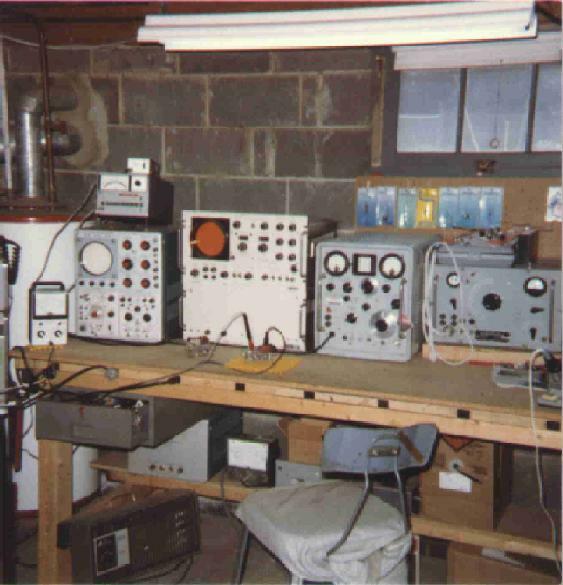 I still had the VOM and DMM and even an osiloscope, but not a real test bench since moving to Lakewood in 1985 when I sold most of my test equiopment for lack of enough space to put it all in. 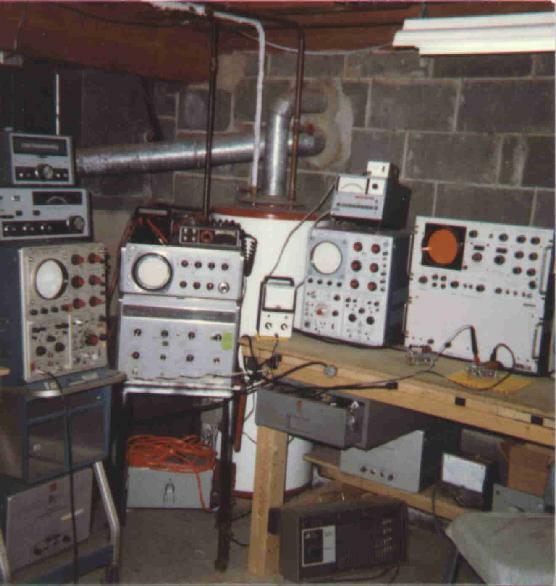 Between 1975 and 1985 I built two large 10x3 foot test benches in the cellar of my parents house (with my Fathers help) that hosted the equipments pictured below. There was no way I was going to get this stuff into a small ranch with no basement that would soon also occupy my child bride to be ! 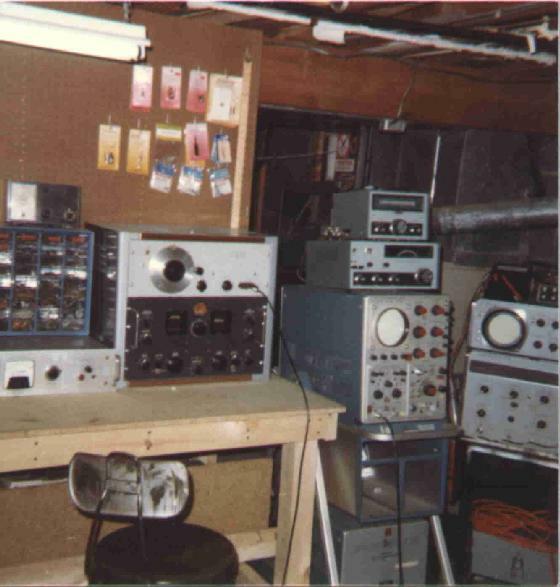 I had all the required equipment to perform calibration, alignment and repairs to most amateur and commercial radio equipments on the time. 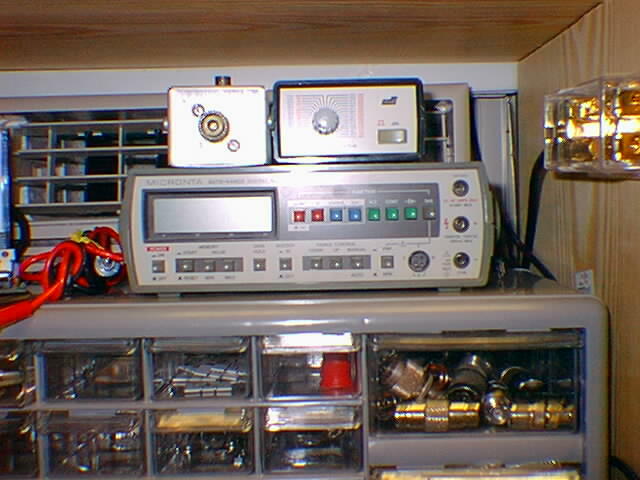 In the photos among other things one can see a GE 100 Amp DC power supply, Hewlett Packard Audio and RF signal gererators, Hammerlund receivers (coverage of DC through UHF). 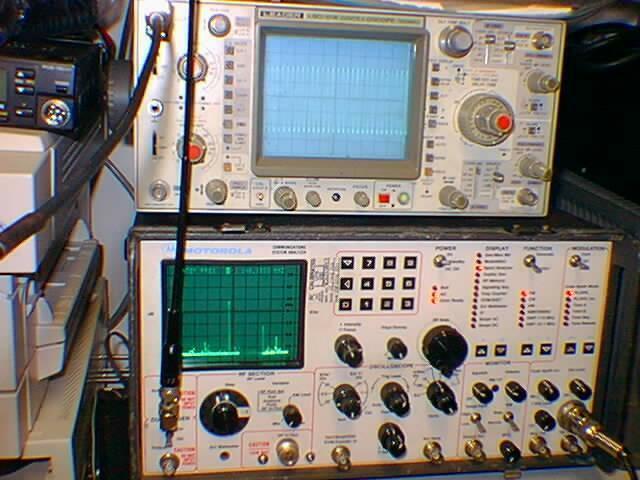 Tektronics Osciloscopes and Hewlett Packard and Singer Spectrum analyzers (DC to 40Ghz), HP RF Milivolt meter and various other meters, bridges and signal sources. However, I disposed of most of the equipment when I moved into my current home as I had no basement and did not plan to continue the type of experimentation and electronics work that demanded such equipement. 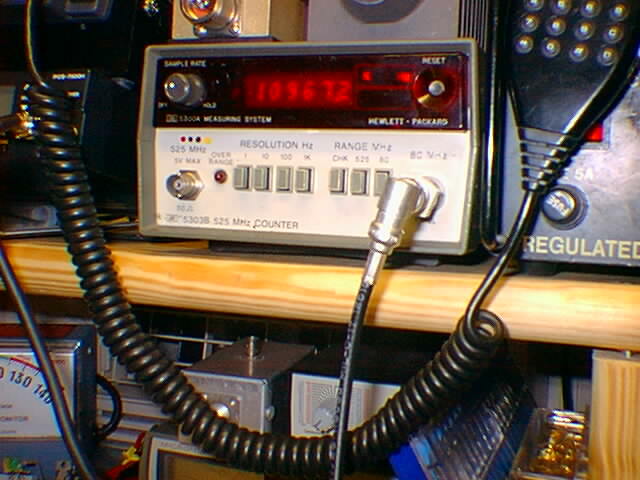 When it comes to test bench work these days my main interest is the building of VHF/UHF FM repeater systems and the restoring old Yaesu FT-101x series transceivers and amplifiers as well as reparing whatever drops dead for either lack of use or heavy use. 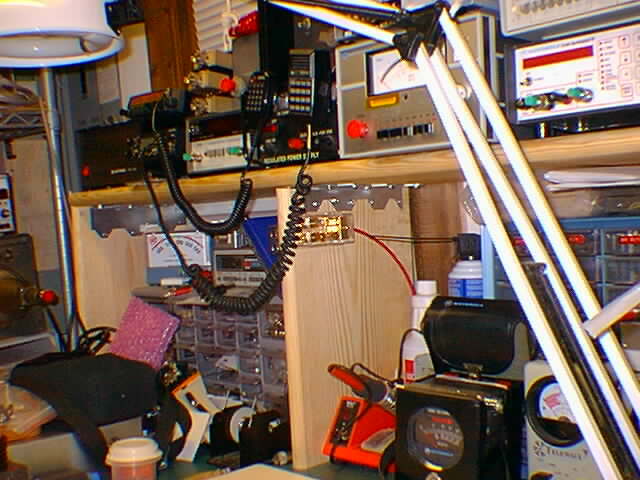 As such I have recently built a new test bench around two-way radio specific service equipments in particular. 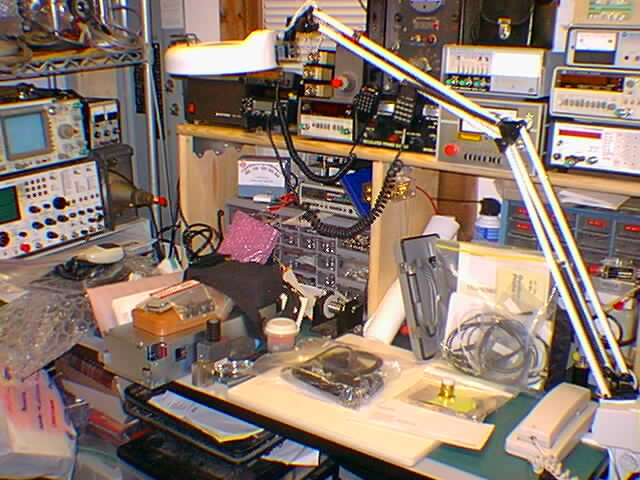 As we entered the year 2001 I started to get refocused on various aspects of Amateur Radio and realized that I once again required a real test bench. Not having the room that I once did has necessitated a more compact set up and luckily the equipments have gotten smaller over the years. 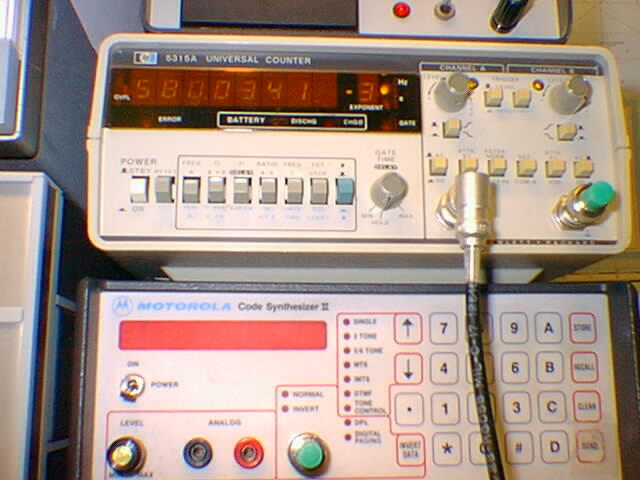 I have a number of equipments that overlap each other in features and frequency ranges for multi purpose applications. My bench is based on a heavy 1 1/4 inch thich formica work table with an adjustable steel frame for height above floor dimensions. The table top is 30 deep by 48 inches wide. On on the table top is a 34 x 48 inch 3M static control table mat (color green) with wrist strap table top grounding system. I also have a 16 x 16 inch square 1/2 inch thick Teflon plate (color white) that sits on top of the 3M anti-static mat for use with heavy items that could damage the 3M mat. Fop this purpose I drape Clauss Electronics Division "Softy" anti-static work mats (color white) over the teflon plate. I monitor my A.C. power line with a Viz RMS line monitor which has a calibrated scale of 100-140 volts. I also have a Northern Technologies A.C. power conditioner as my A.C. outlet for A.C. powered equipments under test. For D.C. power sources I have four analog power supplied in the bench. 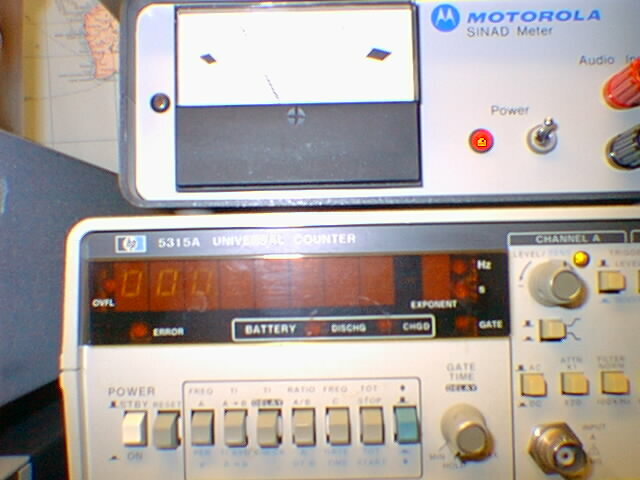 An Astron RM-12, 13.8v D.C. 12 amp peak unit. An Astron RS-50M 13.8v D.C. 50 amp peak supply with a heavy 8 gauge dual outlet fused power buss to the bench for powering and testing high power trasmitters and amplifiers. 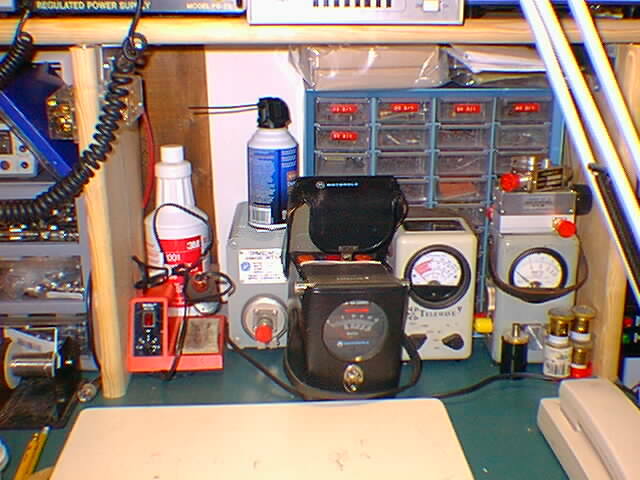 I also have two variable voltage bench top supplies, a 0-50 volt 2 ampere New Jersey Electronics (NJE) model LVC 50-0.5 laboratory power supply (made while my father work for the company and was production manager) and a 4.5-15 volt 25 amp Pyramid Pase III supply. The main piece of equipement is a Motorola R-2002D/HD Communications Analyzer, commonly referred to as a Service Monitor. 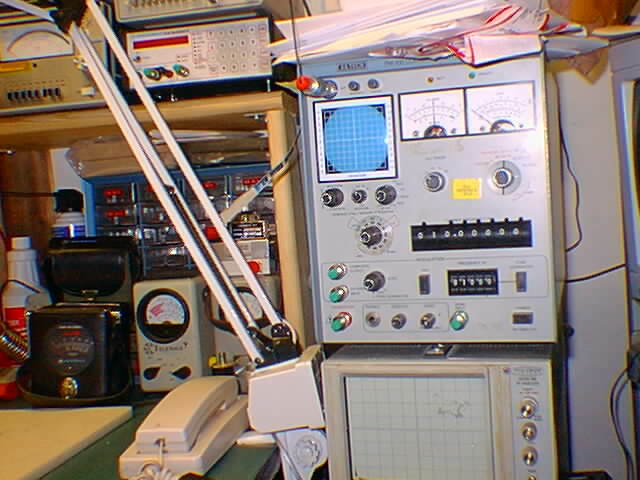 I found a fairly good deal on a surplus unit from the U.S. Navy used by the Navy Metrology and Calibration METCAL that was kept in tip top shape and came complete with all accessories. 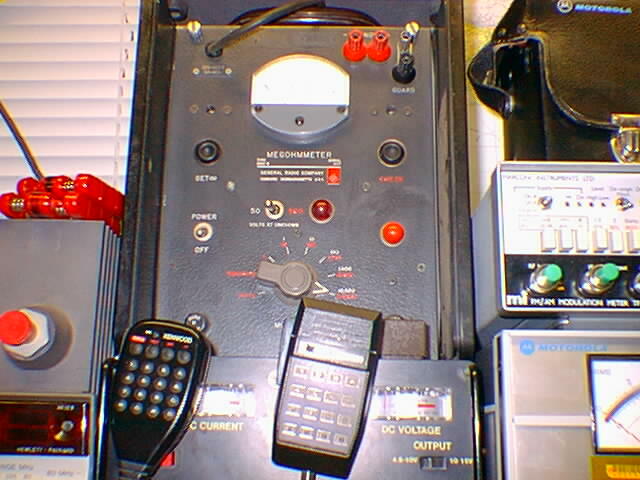 Next is an older Eaton AILTECH FM-100 Service Monitor. Then there is a Wiltron 640 RF Network Analyzer (under the Ailtech) which includes such desirable features as a 1 to 1500MHz RF sweep generator which covers the entire range in one continuous sweep is also part of the bench. This item serves mainly for the tuning of duplexer and filter cavities and testing of transmission lines. 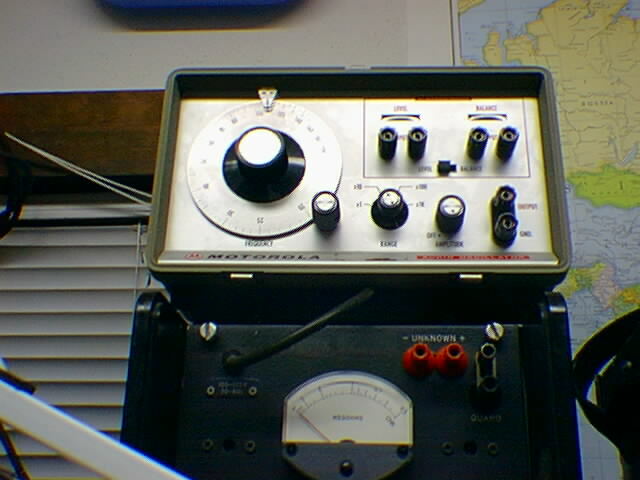 A general purpose portable, lab quality oscialloscope. 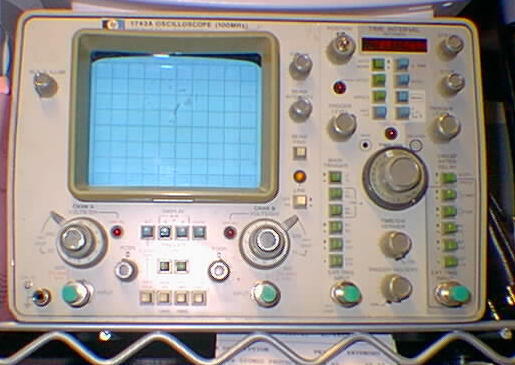 A general purpose portable, lab quality oscilloscope shown seated on top of the R2002D. The 5300A Measurement System Mainframe unit provides the system power, reference frequency, display, counting logic and timing control required for plug-in's. Features include: 6-digit dot matrix display, overflow indicator, standard timebase, external timebase input and BCD output as a standard rear panel output. The crystal frequency is 10MHz with a typical stability of less than plus or minus 2 parts in 106. 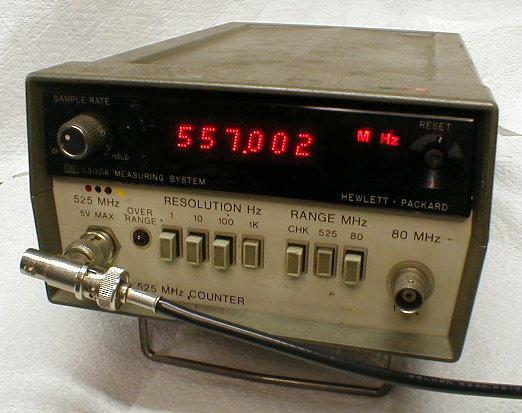 Oscillator output is 10MHz, approximately 1 Vrms at rear panel BNC, 100 ohm source impedance. HP 5300A measuring system mainframe with a 5303B frequency counter module that has a 6 digit dot matrix display, standard time base, external time base input & BCD output as a standard rear panel output. The 5303B has 2 input channels: Channel A (CW or Burst) has a range of DC to 525MHz prescaled by 8 and Fixed Sensitivity 100 mV rms sine wave, dc to 500MHz. 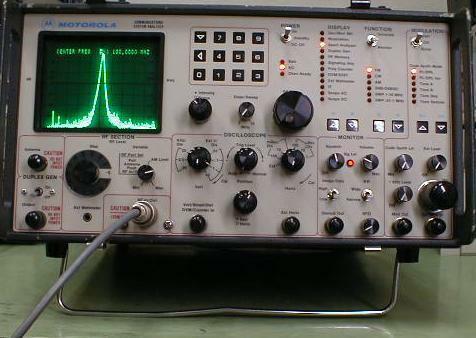 125mV rms sine wave, 500MHz to 525MHz. Signal must pass through zero Channel B (CW or Burst) has a range of 50Hz to 80MHz direct and Automatic Sensitivity 25 mV rms sine wave, 100Hz to 50MHz. 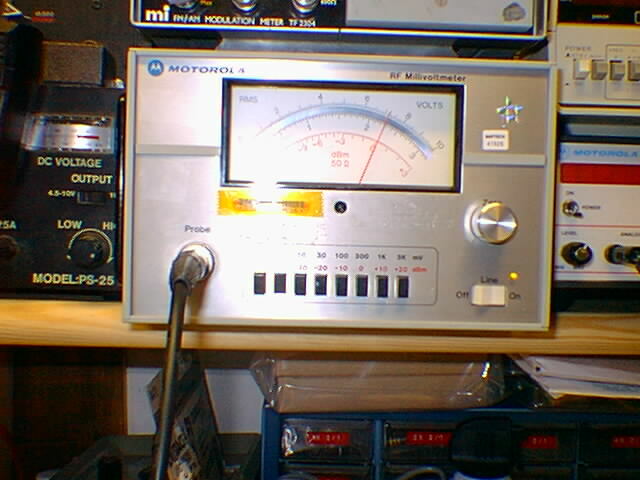 50mV rms sine wave, 50 Hz to 100 Hz and 50 MHz to 80 MHz. Sensitivity is adjusted automatically by Automatic Gain Control. 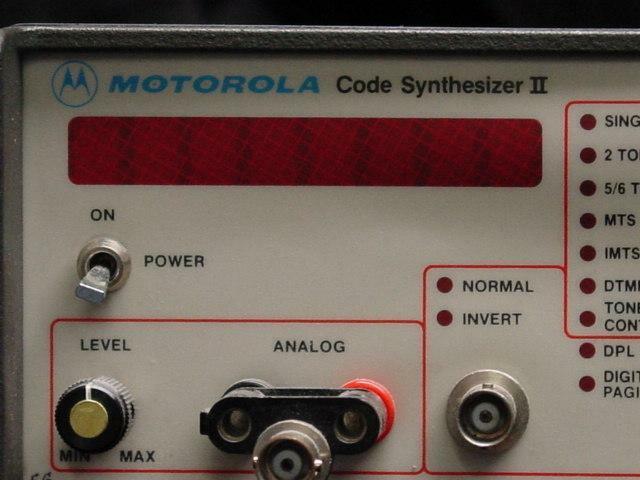 Motorola R-1150B Code Synthesizer II for external tone signaling. The Code Synthesizer is a universal signaling encoder that generates tone digital signaling codes used in two-way radios, paging, and car telephones to include Single Tone, 2 Tone, 5/6 Tone, MTS, IMTS, DTMF, Tone Control, DPL, Digital Paging tests, with 8 digit readout. In single tone it operates as a general purpose audio oscillator. 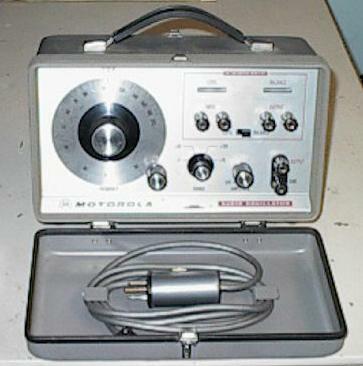 Motorola S-1350A portable watt meter. 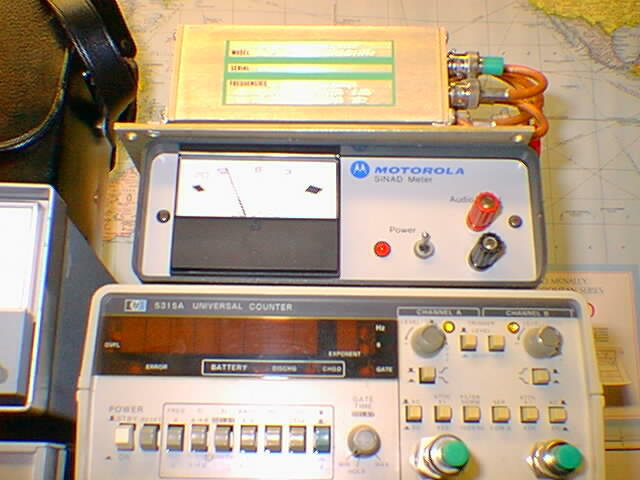 A Motorola radio specific test set for metering of receiver and transmitter stage A.C. or D.C. voltages and current parameters for radio alignment. It also provides accurate measurements of audio output for receiver quieting or Sinad measurements. A self contained speaker permits audio monitoring and a built in PTT switch or optionally either a Motrac or Mostar wired microphone can be used for PTT and actual voice transmissions. 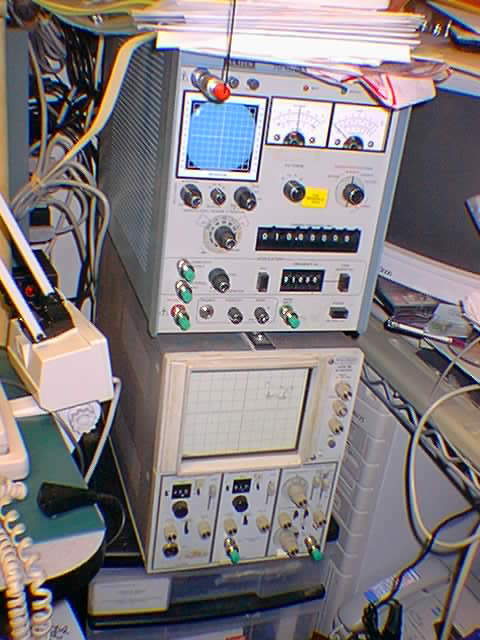 Also built in is a 1Khz oscillator for Sinad testing. 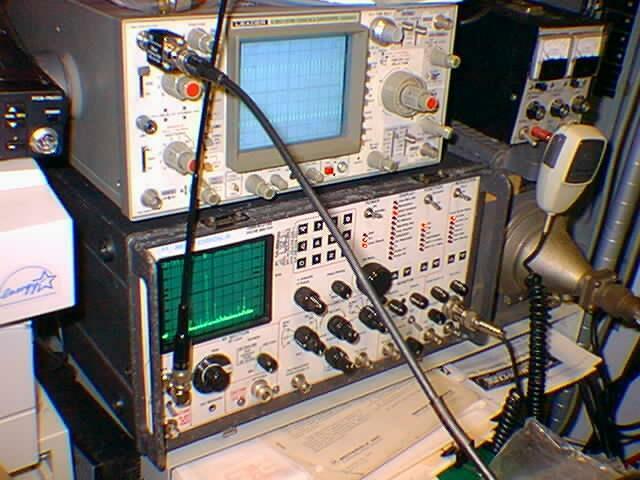 I was lucky that when purchased I received complete cable sets and documentation with the unit for the testing of Mitrek, Micor, MSF-5000 and other Motorola radio types. RF Milvolt Meter, analog, mirrored scale, 50 ohm impedance, frequency range of 10 kHz to 1.2 GHz. RF level measurement sensitivity ranging from .1-3000 mV (100uV to 3V) RF. It also can measure in dbm, ranging -50 to +20dbm. 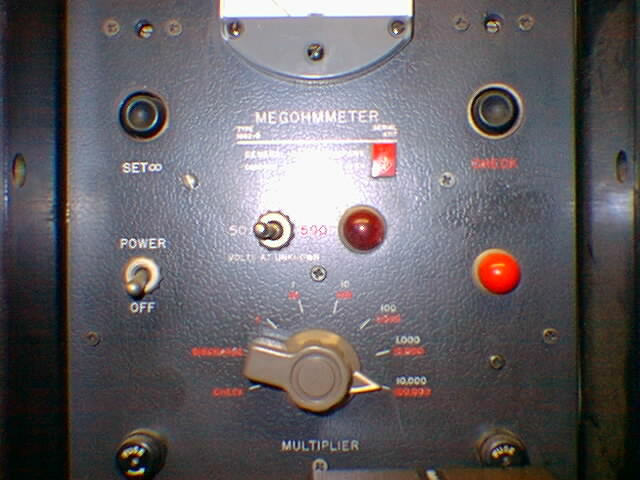 Built in A.C. powered or DC powered bench top Sinad meter for receiver sensitivity measurements. Sinad or rather Signal-to-Noise-And-Distortion ratio is the ratio of the input signal to the sum of noise and harmonics: SINAD = 20 log (SignalRMS / (Noise + Harmonics)RMS). This specification must include the input level used to determine the specification and the bandwidth over which the specification is measured. 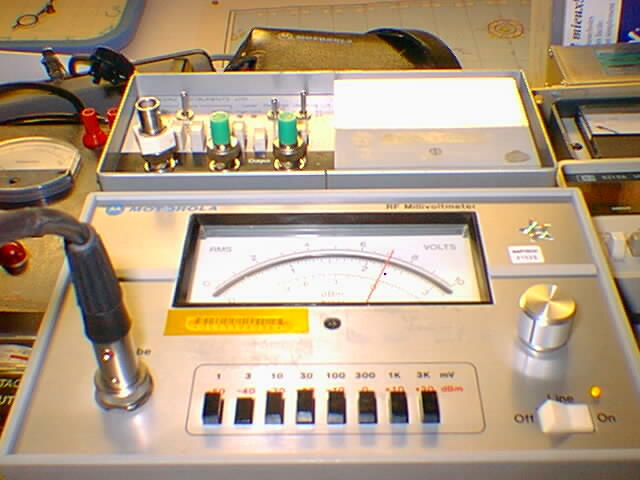 An older piece of equipment that provides a stable audio range oscillator with analog distortion analyzer. AC or DC powered. Marconi model TF-2304 FM Deviation/AM Modulation meter. 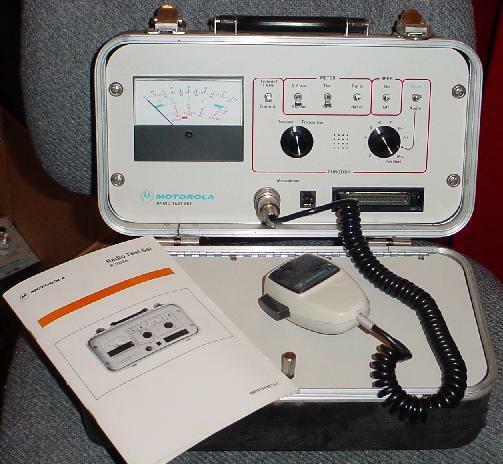 Aa portable insertion-type instrument. It accurately measures forward or reflected power in coaxial transmission lines under any load condition. Power range is 100mW to 10 Kw using Bird plug-in elements with an accuracy of +- 5% of full scale. Frequency range, depending on elements is from 0.45 to 2300 Mhz. In addition to the standard elements listed below for testing exciter and power amplifier levels, I also have a special Bird slug with a 50 db down port over the range of 25-1000Mhz at up to 500w. 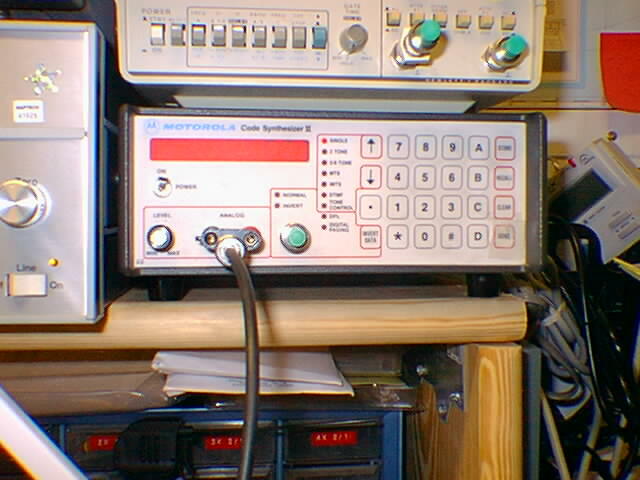 This sampler slug has a female BNC output to test instrumentation such as an oscilloscope, spectrum analyzer etc. High-Power Oil-Dielectric 50 ohm dummy load with an N type female connector termination. : Power Rating: 1000W continuous, Frequency Range & VSWR: 1.1 max. dc to 1000MHz, 1.25 max. 1000-2000MHz 1.3 max 2000-2400Mhz over an ambient temperature range: -40°C to +45°C, Load coolant: 1.1 gal. (4.1 liters) silicone oil and weight of 25 pounds. I have two 150 Watt continuous rated dry 50 ohm dummy loads that cover a frequency range up to 2.4 GHz. with an N type female connector termination. I have two older 51.5 Ohm impedance 500 watt coaxial oil dielectric cooled rated DC - 2.5Ghz @ VSWR 1.1 Max. Rated 2000 watts with cooling, with an N type female connector adapater termination. I also have one Bird model 8085 50 ohm 50 watt Termaline load with male N connector. I have four (4) Celwave 25w continuous 100w intermittent N male loads, one with a 50db down signal tap. 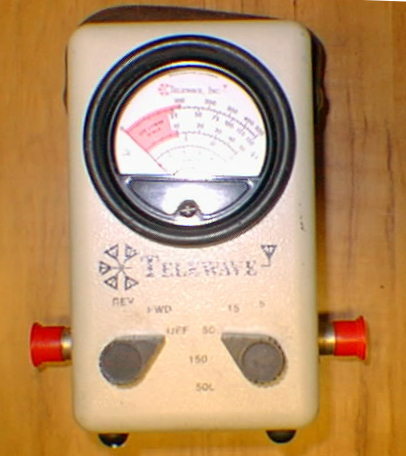 Telewave model 44A diretional watt meter. General Radio Company 1862B Megaohmmeter. I have one Hewlett-Packard 355C .5 watt 50ohm DC-1000mhz 1-12db with BNC connectors. I have two (2) JFW Industries model 50R-080 0-12db 1 db step attenuators with N connectors. Frequency range and power rating are unknown at this time.